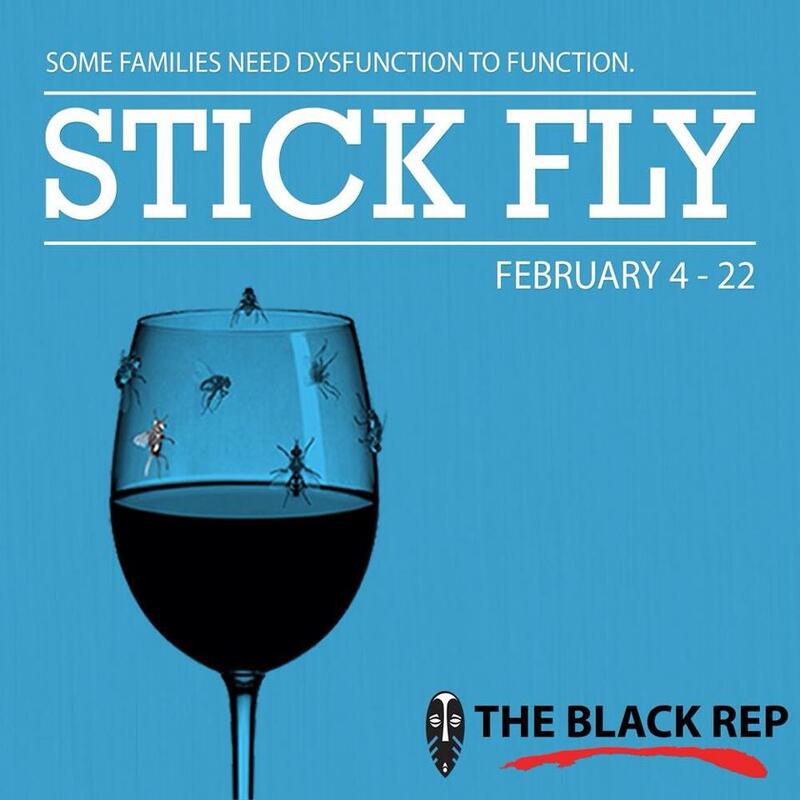 Stick Fly, the latest production in the Black Rep’s 2014-2015 season, is an exploration of the various interpersonal dynamics that occur within a family. It’s playwright Lydia Diamond’s look at relationships that almost seems like two plays. The Black Rep, with its very strong cast and production values, presents this somewhat complicated and disjointed play with wit, intelligence and honesty. The story revolves around the Levays, a wealthy African-American family who have owned a home on Martha’s Vineyard for generations. Through the course of a weekend get-together, we meet newly engaged Kent (Chauncy Thomas), or “Spoon” as his fiancee Taylor (Sharisa Whatley) calls him. The highly educated academic Kent has come to the house this weekend to introduce Taylor to his family. Taylor, who is from a more middle-class background and grew up estranged from her father, a famous educator, doesn’t know exactly what to expect. Eventually, we meet the rest of the family, including Kent’s older brother Flip, who also has a new woman in his life that he’s anxious about introducing to the family–his girlfriend Kimber (Meghan Maguire), who is white. There’s also Cheryl (Rhyan Robinson) the teenager daughter of the family’s longtime maid, who is following in her mother’s footsteps; and the patriarch of the family, Joe Levay (Erik Kilpatrick), who has shown up this weekend without his wife, to the confusion of his sons. As these various characters meet and interact, tensions arise based on many different factors, including wealth and social status, race, and family expectations, as well as what it means to be a father and a “real man”. This is an oddly structured play, in that the second act is significantly stronger than the first, with the first act setting up situations and introducing characters in a somewhat rambling way, until the action finally starts really moving in the second. The cast performances reflect this disjointedness, as well, displaying considerably more energy and ensemble chemistry in the second act. As far as I’m concerned, the second act could be the whole play, because that’s where a mildly interesting play becomes a truly fascinating one. So many compelling issues are explored, from Kent’s desire to be an honorable man in the midst of pressures to be otherwise,; to Flip’s continual resistance to “settling down”; to Taylor’s insecurities about her relationships with men, including her famous, deceased father; to Joe’s weariness at dealing with years of racism despite his affluence, as well as his dilemmas concerning parental responsibility. There’s also Kimber’s having to deal with being an outsider in this group, as well as her own desire for a commitment from Flip, who may not be able to give that. And then there’s Cheryl, whose story is perhaps the most compelling of all, as she deals with issues of identity, expectation, and what bearing some long-kept secrets will have on her future. The acting here is remarkable. Aside from the general lack of energy in the first act–which can be attributed to both opening night and the fact that Act One is largely unnecessary–the cast really brings out all the energy, wit and drama especially in Act Two. As Kent, Thomas is charming and sympathetic, projecting a real sense of honesty, reliability and genuine warmth as a man who may feel like an outsider in his family, but in many ways is the one who most has his act together. Pierre, as Flip, expertly manages to project an air of carefree irresponsibility while, at the same time, showing that somewhere inside, there is conflict and genuine concern. Whatley plays the conflicted Taylor with gutsy bravado one minute, and guarded vulnerability the next, and her scenes with both Thomas and Pierre are highlights. There’s also excellent work from Maguire as Kimber, who obviously loves Flip but is just as obviously trying not to get too attached; and Kilpatrick as the weary but still formidable Joe. Robinson, as Cheryl, is also outstanding as a young woman on a personal quest to come to terms with a revelation she didn’t ask for. The technical aspects of this production are top-notch all around, for the most part. The gorgeous set, designed by Colt Frank, is meticulously appointed and luxurious, effectively reflecting the elegant style of a Martha’s Vineyard retreat. Ali Turns’s costumes are also particularly appropriate, with some fun little touches like Kent’s orangey-red cropped pants. Jim Burwinkel’s lighting illuminates the scenes well. In terms of the sound, designed by Robin Weatherall, there were a few volume issues in the first act, although everything ran (and sounded) much more smoothly in the second. Stick Fly is a strange play in one regard, in that the bulk of the meaning, action and force of this story is told in the second act. Still, it’s a truly marvelous second act. Especially in that second act, The Black Rep and director Lorna Littleway have presented a show that deals with many issues with a near-seamless blend of comedy and drama, with a virtuoso cast. Even though this really is half of a great play, it’s well worth seeing because that half is truly remarkable.